2017 was a devastating year of catastrophic floods, hurricanes, wildfires, earthquakes and terrorist attacks affecting millions across the globe. Whether you’re facing a natural disaster, terrorist attack, power outage, are lost in the woods, or there is a zombie apocalypse on the rise, you need to be ready for anything! The five basic needs of survival are oxygen, water, food, shelter, and sleep. 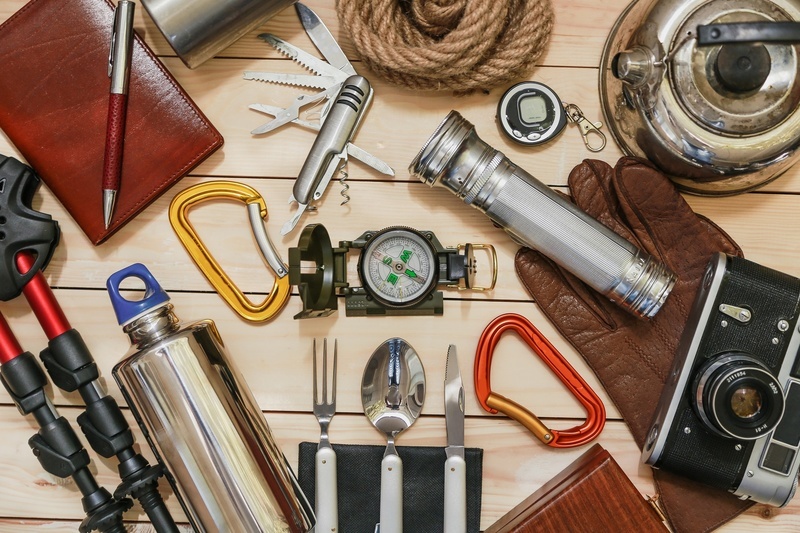 So whether you’re bugging out at home, or you’re on the run in an emergency, there are several survival tools you need to fulfill these basic needs. Read on for the must-haves you should always have easy access to in an emergency. A human can survive without eating for three weeks, but just a week without water can prove to be fatal. Dehydration is one of the deadliest and most overlooked things that can happen in times of emergency. If you’re at home, you need a three day supply of drinking water to keep you going. But if you’re out in the wild, instead of drinking nasty, bacterial laden water that’ll make you sick, use a portable water filter. They are designed to remove dangerous bacteria from water and can be carried around easily. Water purification tablets are another great option. A water bottle is also essential to survival, as you’ll rarely know how far the next available water source is. Get a metal, single wall water bottle that can also be used to boil water over a fire. Keep non-perishable food in your home at all times ready for emergencies. Canned fruit, peanut butter, and protein bars are all great options. In times of emergency, there may be extreme weather or temperatures that make finding a shelter your number one priority. Unless you magically stumble across an abandoned cabin in the woods, you’ll have to make your own. A high-quality survival tarp is an excellent multi-purpose survival tool that can be structured into a variety of shelters for almost any situation. A tent, survival hammock or an emergency bivvy bag are also great options. A tent can be quite heavy to carry around, but a survival hammock and bivvy bag can be wrapped up tightly and are usually lightweight. A bivvy bag is a great option if you’re likely to encounter freezing temperatures. Every survival movie includes a section about the struggle of starting a fire. But don’t worry, if you’re prepared with outdoor survival tools, you won’t need to hit two rocks together to cause a spark. Waterproof matches are essential (avoid regular matches which are useless when wet). Lighters are also a classic option, some are even designed to work in wet and high wind conditions. A fire striker is superior to a lighter because it doesn’t require fuel. Using a fire striker may take a bit of practice, but you can be sure it’ll almost never run out. Another cool piece of fire starting gear is fire shoelaces. The shoelaces have mini fire strikers on the ends. Which means you can wear them as regular shoelaces every day, but if an emergency strikes, you’ll be ready. In many cases, an emergency means no electricity. So, your emergency supplies will be useless without some kind of illumination. A flashlight is essential, not optional. You can even buy torches that don’t need batteries and are powered by a hand crank. A lantern and a headlamp are both other handy tools to have in an emergency situation. Depending on the nature of the emergency, you may vitally need to get in contact with someone or know what’s going on on the local news. An emergency radio is a piece of top survival gear you can use for communication purposes. Having intel on the situation, whether it’s a natural disaster or a terrorist attack is essential in knowing what to do next. There are loads of emergency radios on the market that aren’t powered by batteries or electricity, which is great for emergencies. Many radios also serve as a multi-purpose survival tool with other inbuilt features, such as solar panels, a phone charger, torch, compass and more. Other basic tools could include walkie-talkies, survival whistles, or even a signal mirror. It’s also important to have a way to charge up your phone if possible. You can buy a portable solar charger or a portable charger/battery booster that may help when communication is vitally needed for survival. A first aid kit is a no-brainer. You need to be able to treat minor injuries in any situation. Bandages, antibacterial creams, painkillers, blood clotting sponges, scissors, and plasters are just a few of the essentials needed. Just make sure to avoid the Mickey Mouse first aid kits that come cheap but end up being useless in an emergency. It’s always better to buy one that’s a bit more expensive, as it could be life or death for you and your family. It’s safe to say that a pocket knife is the most popular piece of survival gear that many people add to their bug out bags. A top survival gear knife is a versatile tool that can accomplish a variety of tasks needed for survival. Some survival knives have several other tools attached, such as pliers, a seat belt cutter, glass breaker, spork, corkscrew, can opener and many other useful tools. You can even buy a survival credit card tool. This well-designed card is a slimline gadget which includes everything from fish hooks to saw blades. Just slide it into your wallet and you’ll be ready for anything at any time. Having a rope or paracord in your emergency pack is also a handy and versatile tool. You can bind, cinch, hang, tie, attach, trip and do almost anything with a paracord. Other handy tools could include a compass, a poncho for rain, or even a shovel. It really depends on the situation you’re preparing for. However, all these survival tools can be rendered useless if you don’t use your number one survival tool…your brain! Thinking on your feet, and being mentally prepared is the most essential tool you need to survive in these crazy times we live in. If you’re worried about what to do during these times of emergency, you’ve got to check out our blog. We have all the advice you need to be ready for anything, yes, even in a zombie apocalypse!